Sweet potato fries have to be the most overrated side dish since the San Francisco treat. When sweet potatoes started getting attention as one of the super foods and an alternative to plain ol’ potatoes, everyone put them on the menu. They may in fact be harder to get away from than the royal wedding. I’m all for healthy alternatives, but in my opinion sweet potato fries are gross. They’re greasy and soggy, they never crisp up nicely and the only complementary condament I’ve found to go with them is ranch dressing, which pretty much negates the value of the sweet potato…if deep frying them didn’t already. My friend Frances is the Yam-Queen. She used to bring these beautiful lunch salads to work with chicken and big chunks of roasted sweet potato. Those of us sulking over a can of microwave soup used to marvel at her discipline, but she explained that the secret to discipline was that she actually really liked what she was eating. After a 122 pound weight loss, I’d say she was on to something! Since Frances has very little tolerance for whiners, she shared some of her best sweet potato recipes with me (the latkas are her own creation), and gave me the ok to pass them on to my lovely readers here at Promises. I hope you enjoy them as much as I do, on their own and certainly as an alternative to sweet potato fries. 2-3 medium potatoes, peeled and grated. Place the grated potato in cheese cloth and squeeze out excess juice. Place in bowl and toss with oil, garlic and spices. To bake, take a silicone muffin dish (I use the ones with the larger receptacles) and divide the tossed mixture, filling the tins 3/4 full. Beat the eggs until frothy and pour even portions onto the potato mixture. Place a tomato slice over each latka. Bake at 400 for 20 mins. Boil potatoes until soft, drain and return to pot. Mash. Add coconut milk, vanilla and raisins. If the mix is too thick, you can add extra milk (soy or regular) to bring it to your desired consistency. Return to a boil and serve. If desired, add agave nectar or other sweetness. This will keep well in the fridge for a couple of days. I will also post these up on the Promises Promises facebook discussion page along with my own instructions for BBQ sweet potatoes. 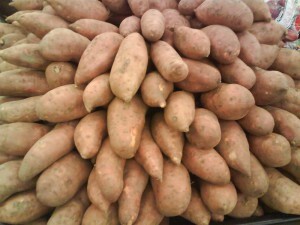 If anyone has a sweet potato favouite recipe, please feel free to share it there too!